The innovative CS7 has already become the industry standard for long-term care beds. With an Auto Contour feature that simultaneously raises both the head and knees, residents stay comfortably in place while being better positioned for reading, watching TV or talking to family members. The simultaneous movement also helps prevent painful skin shearing that might otherwise occur during repositioning. The CS7 bed replaces the Carroll Healthcare SOLO Hospital Bed. 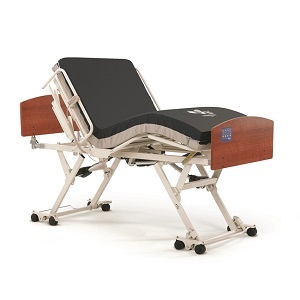 The CS7 Hospital Bed bed is specifically designed for the comfort and caring of dementia and Alzheimer's patients. Quick-ship version of CS7 Bed has Drake style bed ends and 3 colors to choose from. 10 day lead-time, allow additional 5-7 days for delivery. Package includes Assist Rails as pictured below. Thinksoft Positioning Rail is optional and would replace the Assist Rail. allows casters to leave the floor and the bed to rest securely on rubber feet, immobilizing the bed through its entire height range. provides an unencumbered environment and when not required and easily moves out of the way permitting unobstructed access to residents. serves as a stable assist rail, allowing residents to enter and exit the bed with ease. completely fluid proof, shock resistant and impact resistant. universal symbols allows staff to operate functions easily. the lock-out feature restricts any or all functions of the hand control for added resident safety.